Sarada Jha is 25 years old and comes from Manpur Tapara-2, Bardia; she is training to become a Citizen Scientist. 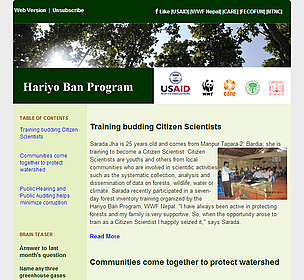 Citizen Scientists are youths and others from local communities who are involved in scientific activities such as the systematic collection, analysis and dissemination of data on forests, wildlife, water or climate. 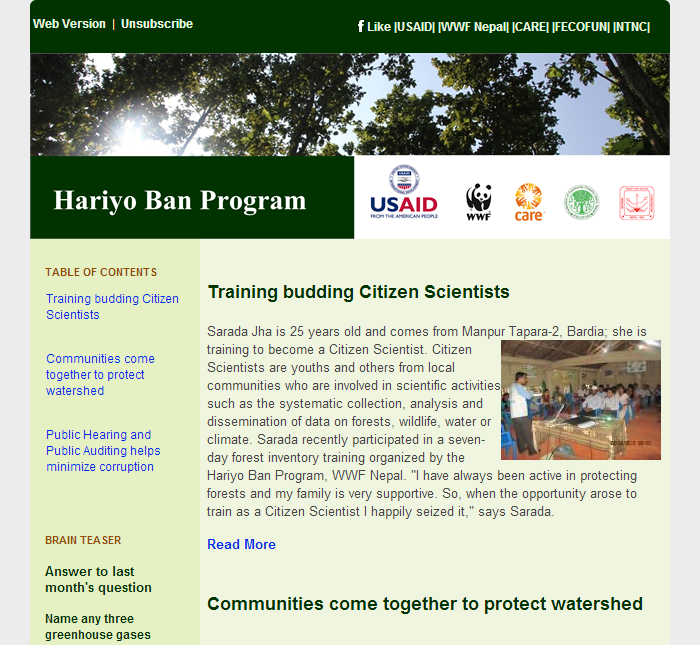 Sarada recently participated in a seven-day forest inventory training organized by the Hariyo Ban Program, WWF Nepal. "I have always been active in protecting forests and my family is very supportive. So, when the opportunity arose to train as a Citizen Scientist I happily seized it," says Sarada. The 12- hectare Tikauli Lake is located in Mrigakunja Buffer Zone Community Forest, Chitwan and is a part of the Bishazari lake system that contains 46 wetlands. Bishazari is a Ramsar site of international significance. Tikauli Lake forms part of Tikauli forest that is an important wildlife corridor, particularly for animals moving between the Siwalik hills range to the Mahabharat mountain range. Tikauli Lake is significant in many aspects – it provides important habitat for migratory birds and mugger crocodile, and also serves as a water hole for large mammals including endangered species such as elephant, rhinoceros and tiger. The lake is seriously affected by invasive water plants, and the Hariyo Ban Program is supporting local communities to manually remove water hyacinth, water lettuce and water cabbage. Ekendra Sunuwar from Kailali, Sugarkhal is very happy. Recently at the start of Hariyo Ban Program activities the Wandali Community Forest Users Group from Sugarkhal gathered for the first time for a public hearing. "In our public hearing around NRs 99,072 was caught in embezzlement and official steps were taken to retrieve the money immediately from the perpetrators. The communities here have understood the importance and effectiveness of Public Hearing and Public Auditing, and now we are committed to continue this every year and to take relevant actions against anyone involved in corruption," says Ekendra Sunuwar. Production of a training manual on mainstreaming Gender and Social Inclusion (GESI) in NRM and climate change initiated. Biogas installation support by NTNC in Chitwan, Bardia and Kanchanpur under full swing. Climate Change thematic meeting conducted with participation of climate change specialists from the four consortium partners. Name any three greenhouse gases among the six main dangerous ones identified by the Kyoto Protocol? According to the Community Forest Development Guideline 2065 BS, what proportion of community forest users committee should be women?